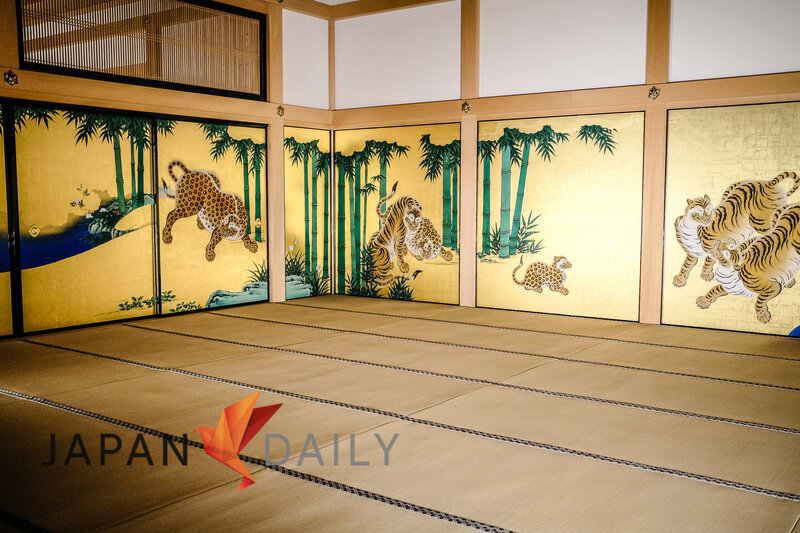 Nagoya Castle is probably the most visited tourist attraction in this city, though over the years many people have criticized the castle for it’s rather lackluster interior. 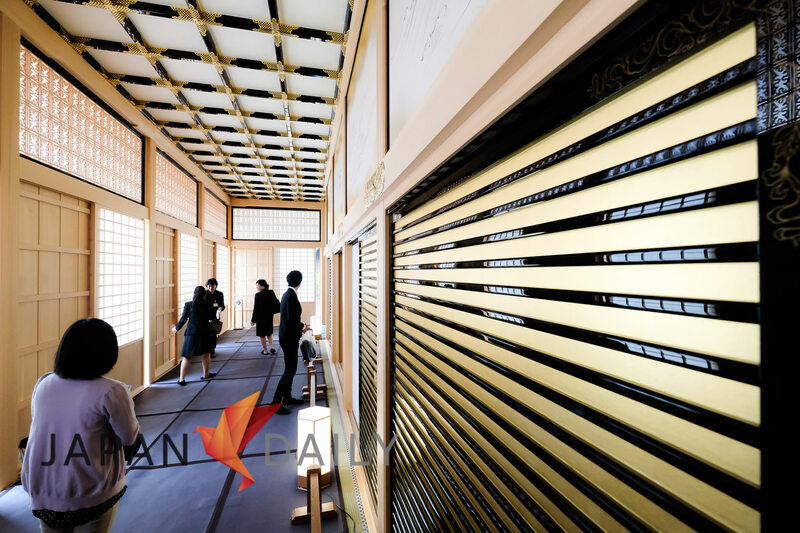 Looking majestic from the outside, the inside felt more like a modern museum, rather than an ancient historical castle. 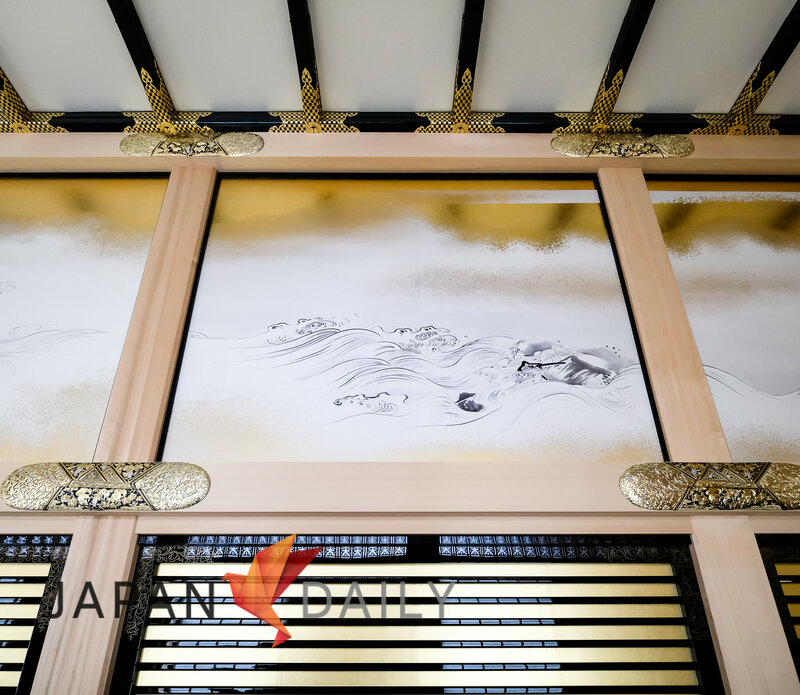 All that is about to change, however, as Nagoya Castle is now in the process of being completely rebuilt to its original glory. The entire castle will be razed and rebuilt out of wood, only using ancient techniques. 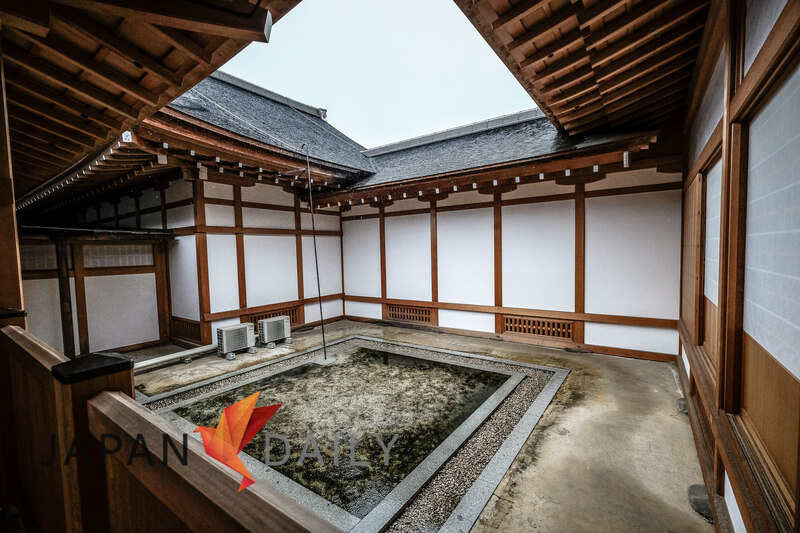 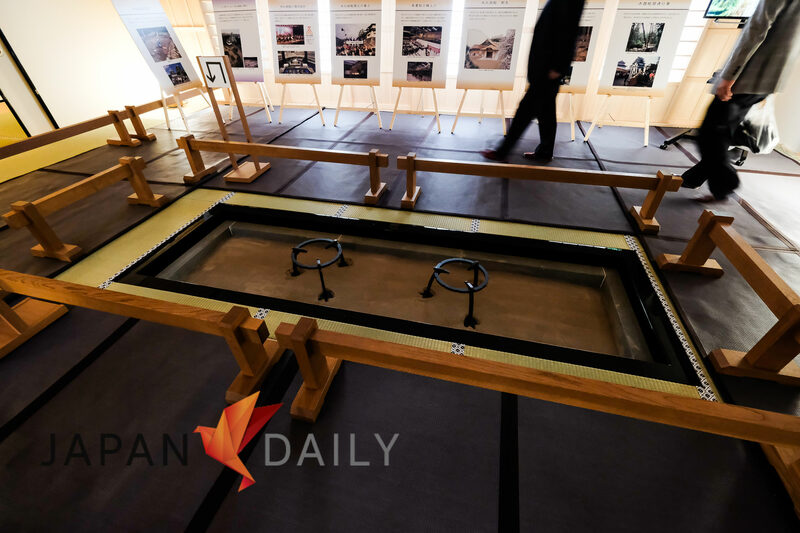 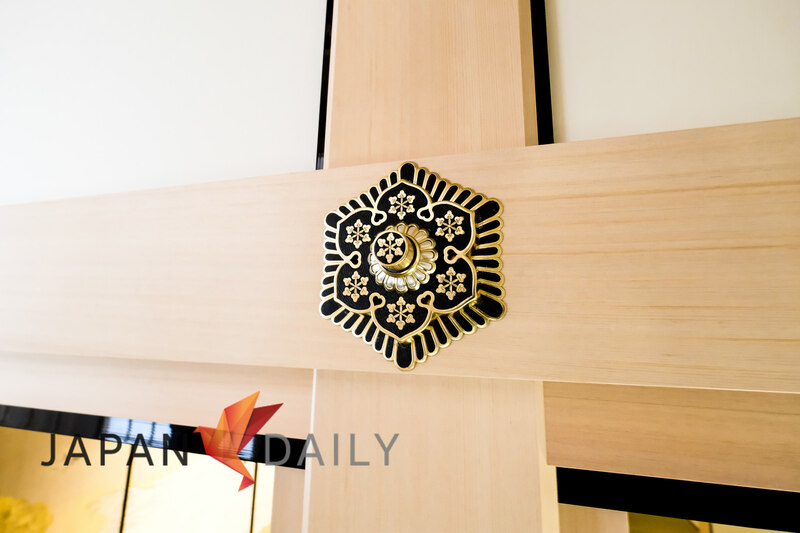 The first step towards that revival is the completion of the Honmaru Goten Palace, which opened the third stage to the Public last week. 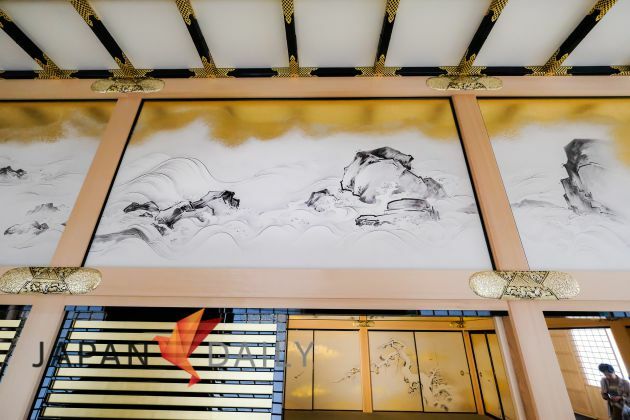 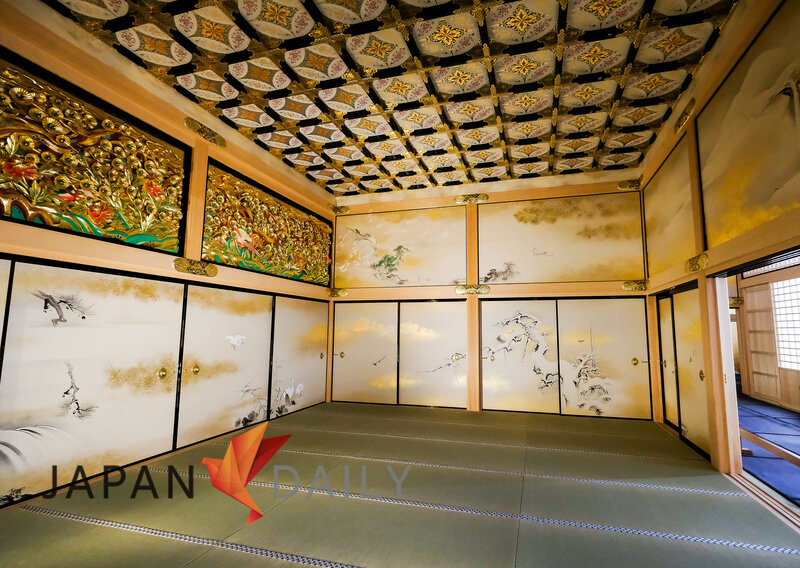 When it was originally unveiled in 1615, It was the most gorgeous castle palace of all Japanese castles, richly decorated with gold-covered walls, and featuring screens adorned in stunning works by the most skilled leading artists of the time. Prior to being destroyed during WWII, it survived numerous earthquakes, the turmoil at the collapse of the Shogunate, and the Meiji Restoration, earning the coveted award of being designated a National Treasure. Unfortunately, it was completely destroyed just prior to the end of WWII. 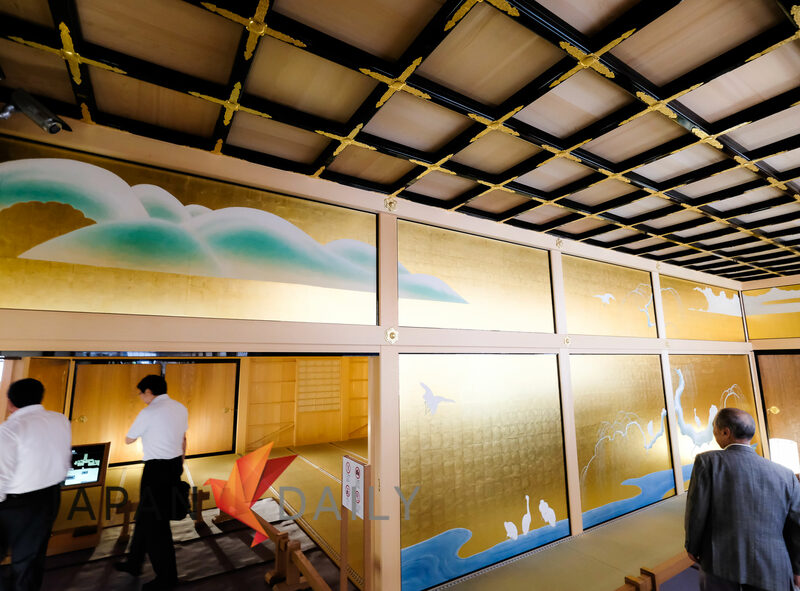 After an extensive almost 10 year reconstruction period, the finished palace is now open to the public once again. 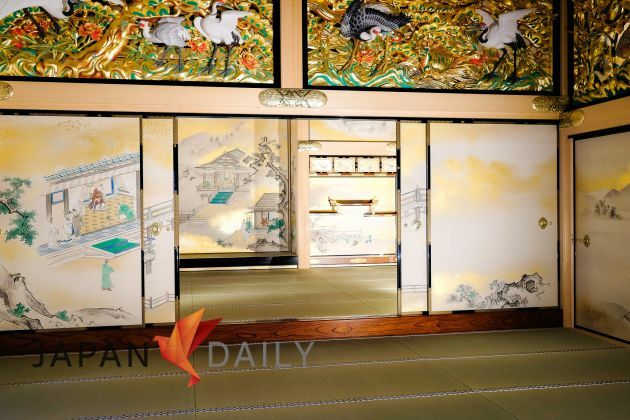 Like a phoenix rising from the ashes, all the previous glory has been painstakingly preserved, using only traditional Japanese artists, craftsmen, techniques, and even materials – this is a rebuild, not a reconstruction, thus making it one of the most authentic palaces in all of Japan. 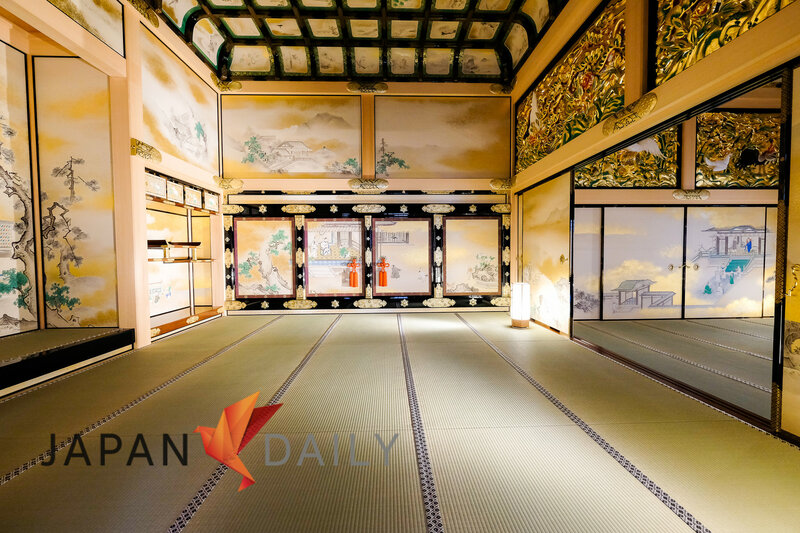 Originally completed in 1615, it was the residence and audience chambers of Tokugawa Ieyasu’s 9th son, Tokugawa Yoshinao. 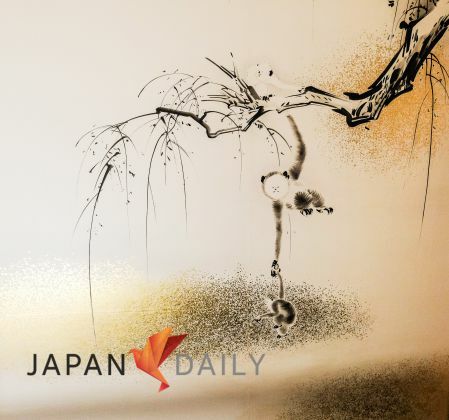 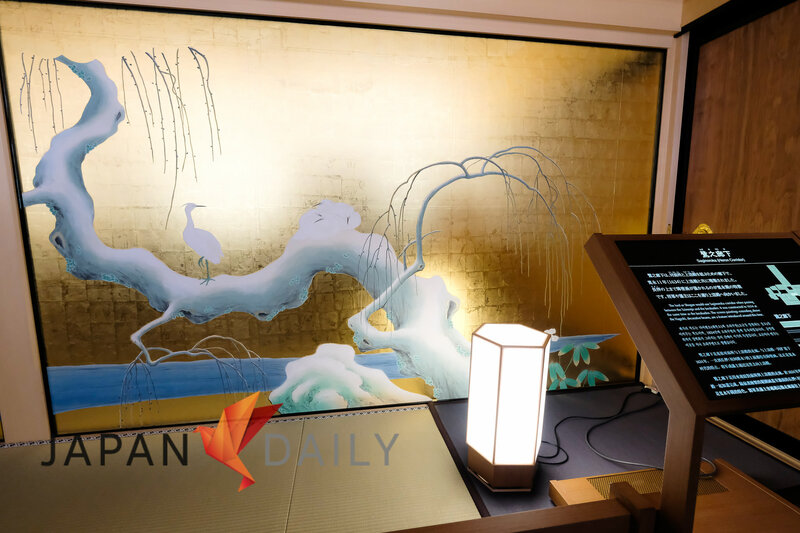 So splendid was the artwork and design, that many of its features were later incorporated into Kyoto’s Nijo Castle Ni-no-Maru Palace, which is now a World-Heritage site. As mesmerizingly beautiful as the palace was, it was also used rather infrequently, thus helping to preserve its pristine beauty. 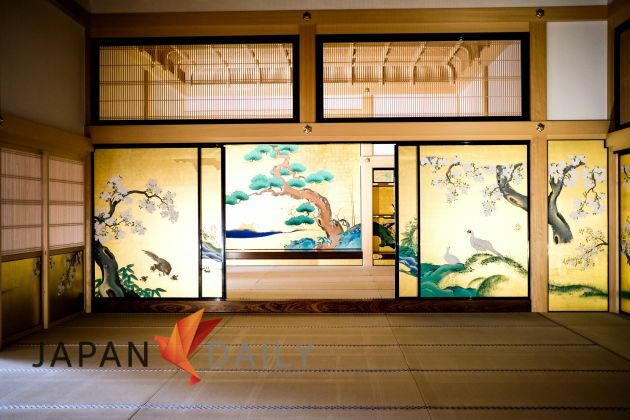 It served mainly as a summer retreat by the Meiji, Taisho, and Showa Emperors. 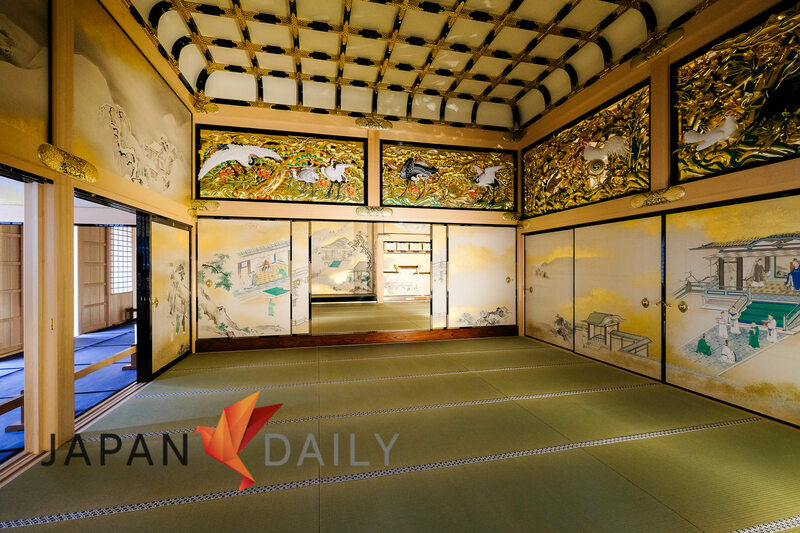 Due to its pristine condition, it was the first of Japan’s castles designated as a National Treasure in 1930. Why was Nagoya Castle specifically chosen as the prime castle to be reconstructed? 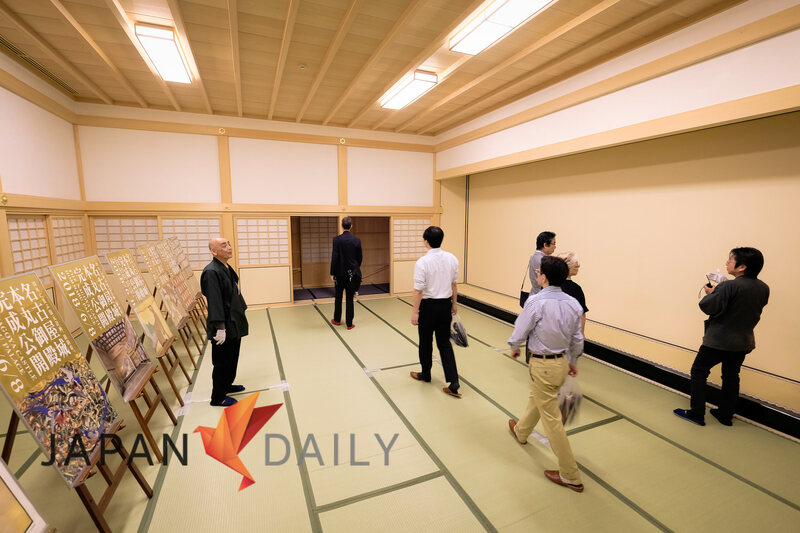 Well, out of all the castles in Japan, Nagoya Castle has the largest collection of remaining historical records, which provide this unique opportunity for a truly authentic reconstruction. 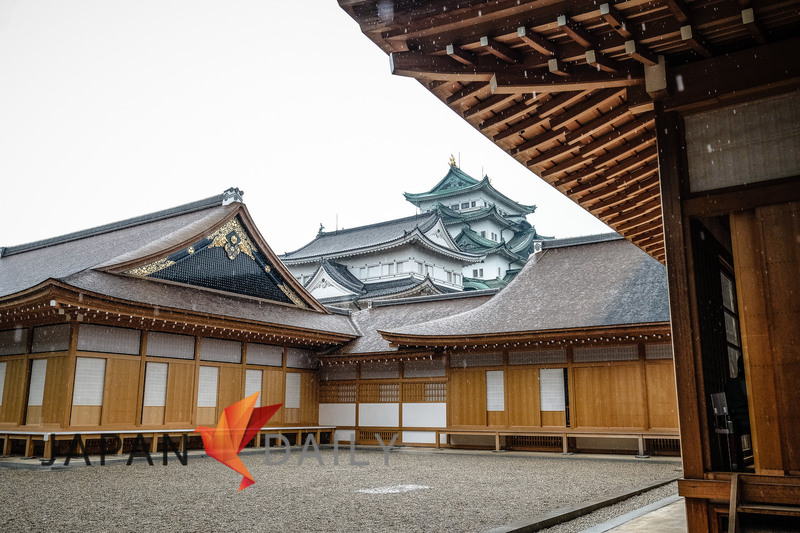 Another reason is that the last feudal lord in Nagoya, Tokugawa Yoshikatsu, was a photography aficionado and took many pictures both outside, as well as inside of the castle, the castle grounds, and the magnificent palace. 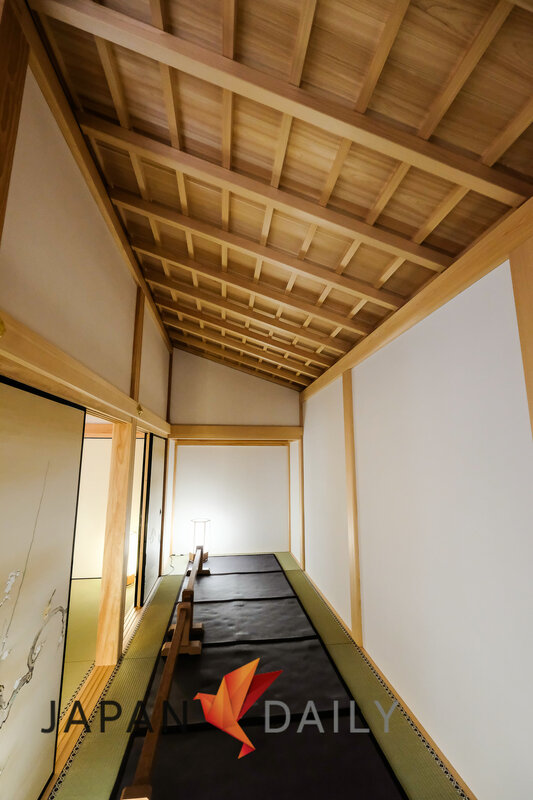 Those well-preserved pictures, alongside the original blueprints were used for the reconstruction project, which exclusively used ancient building techniques. 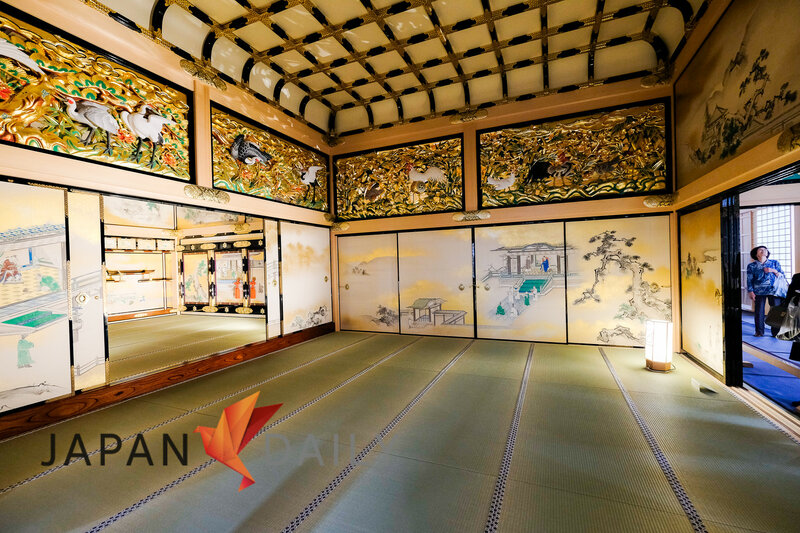 The style of architecture at Nagoya Castle is called Shoin-zukuri and was the preferred method during Japan’s feudal times. 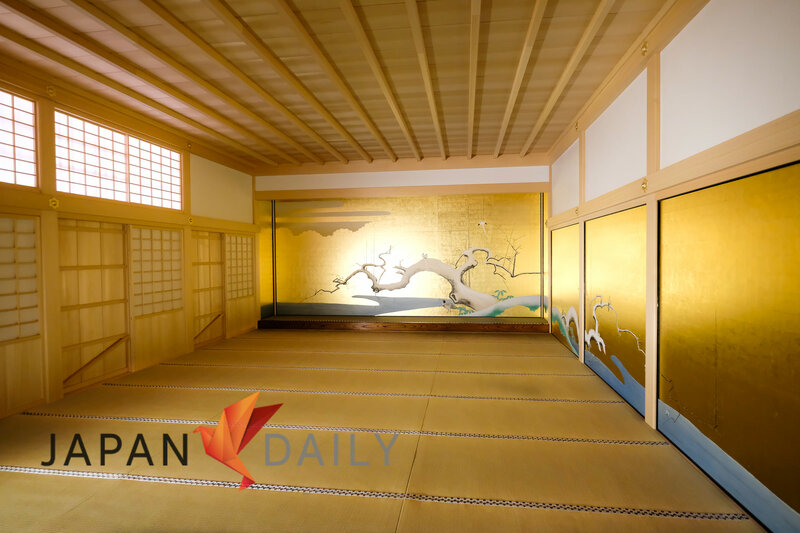 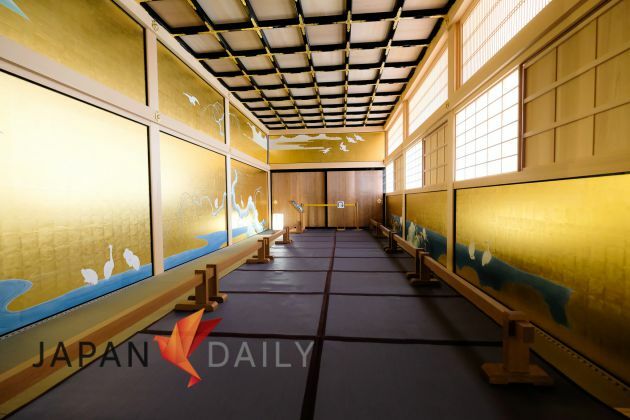 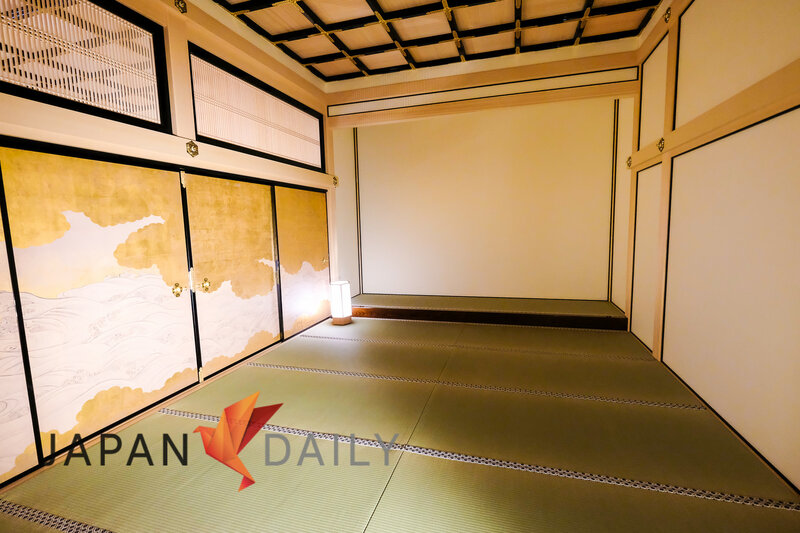 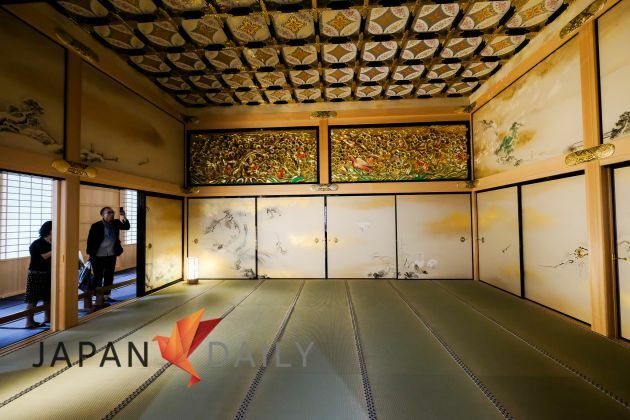 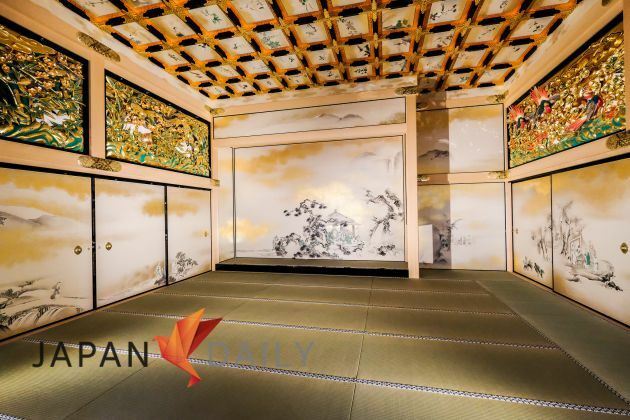 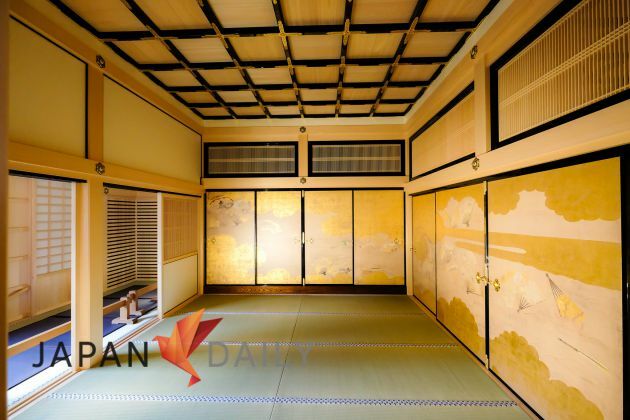 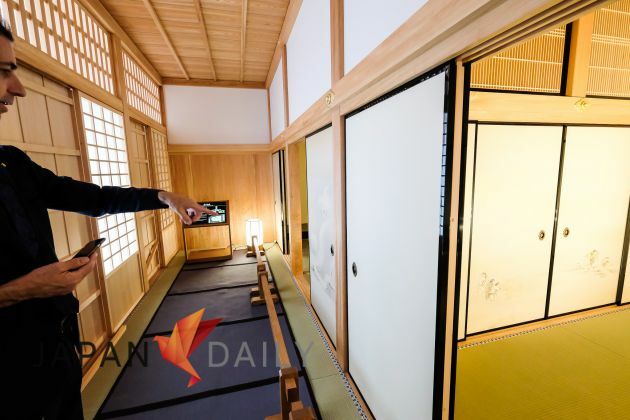 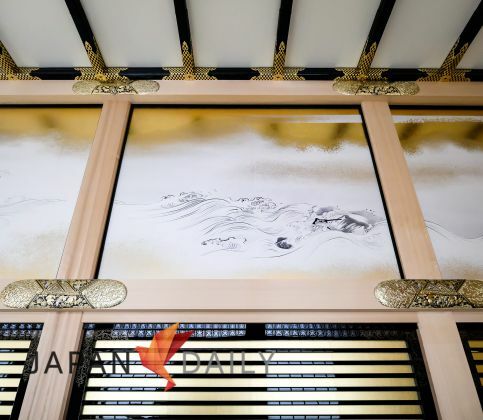 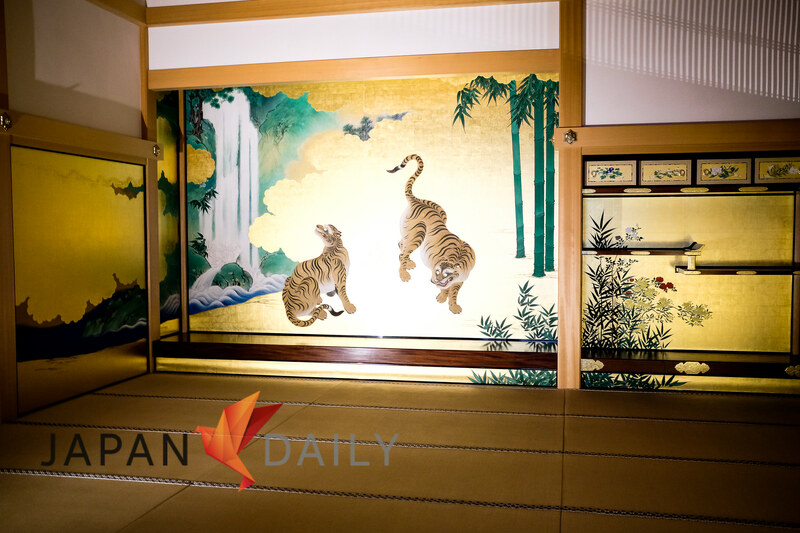 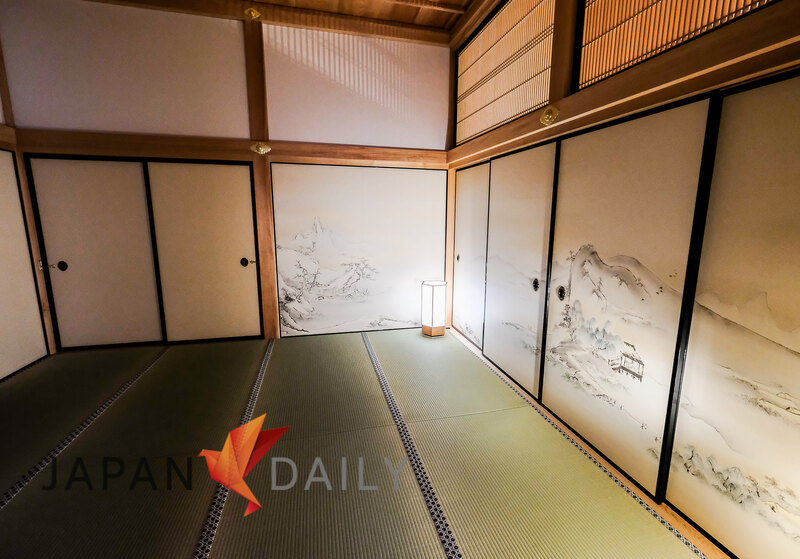 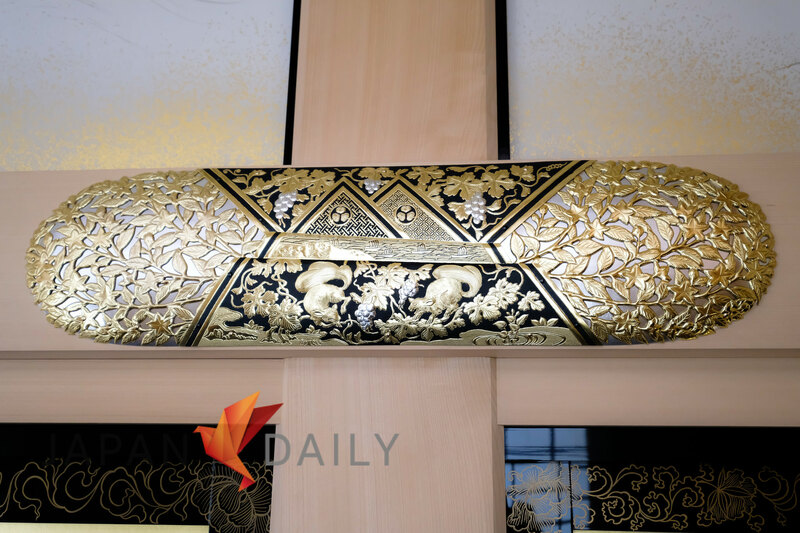 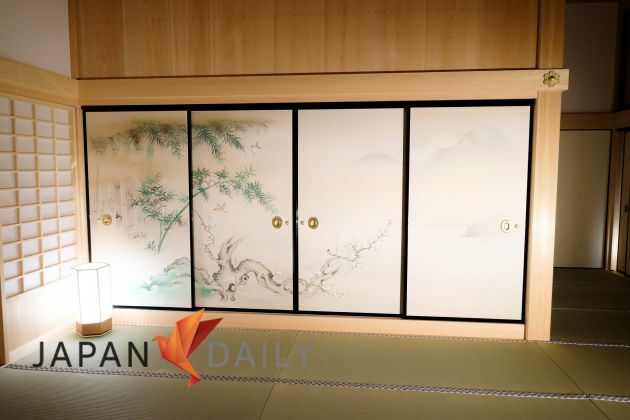 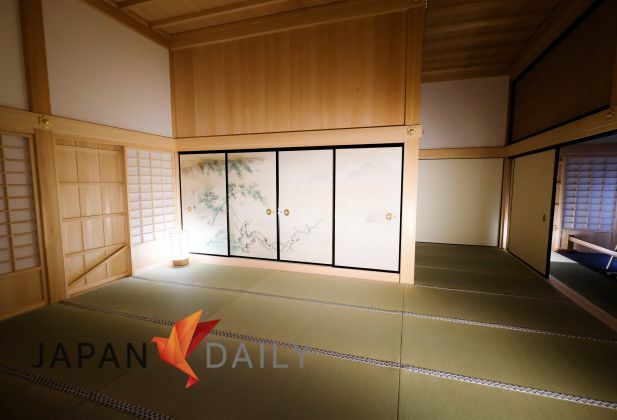 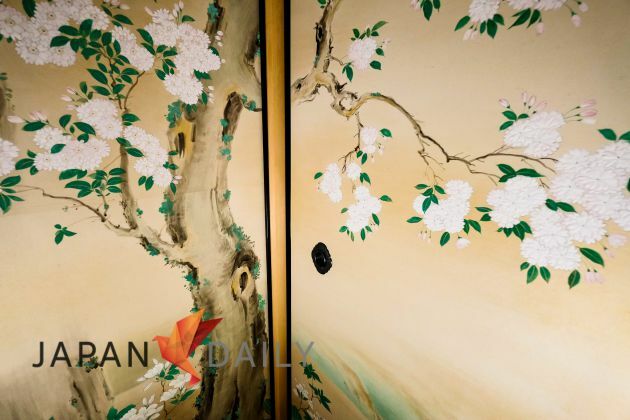 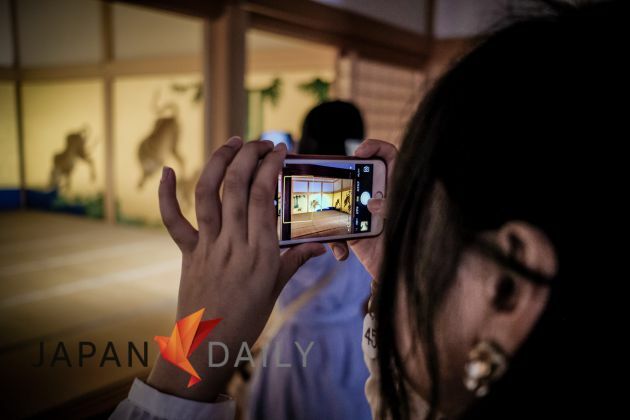 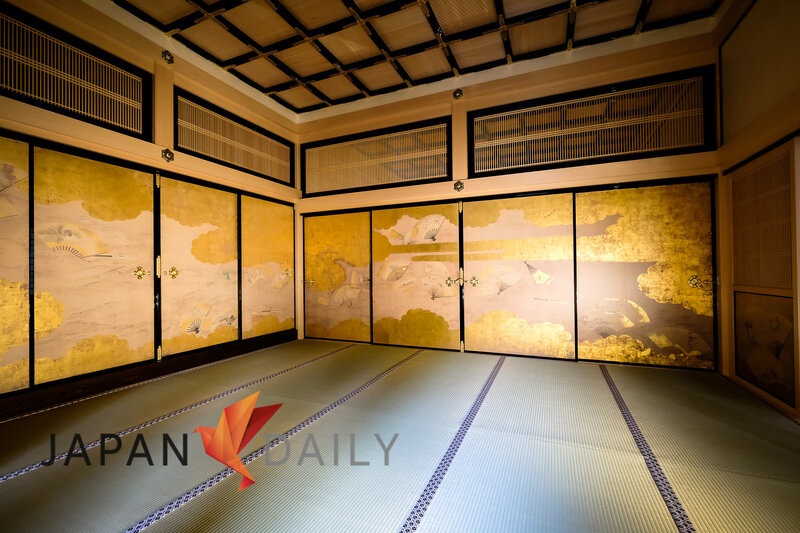 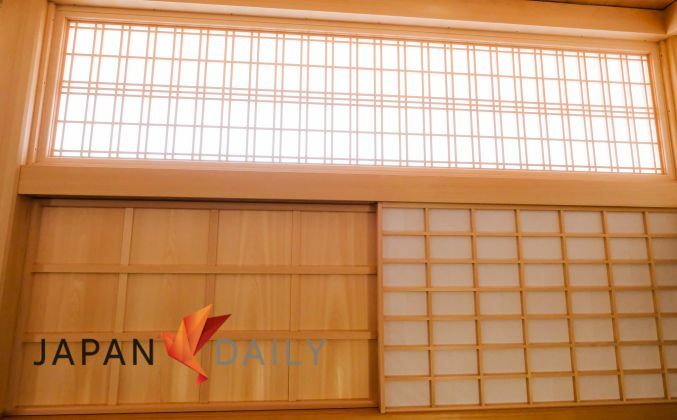 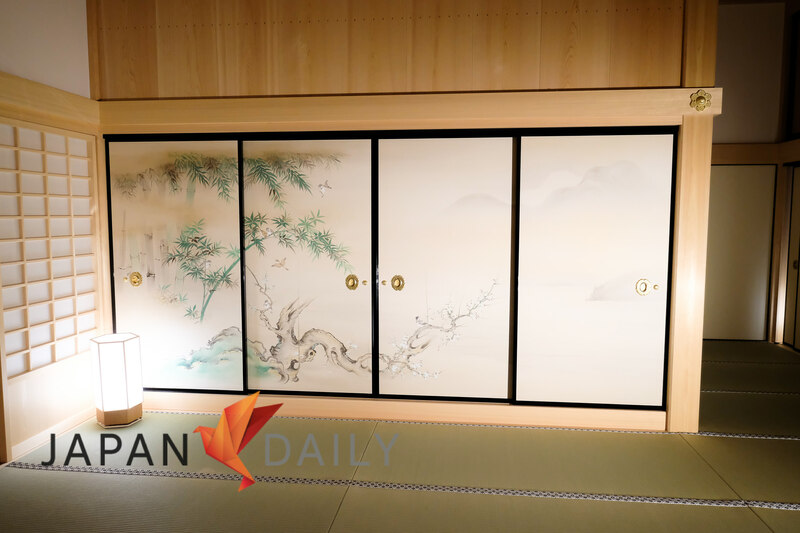 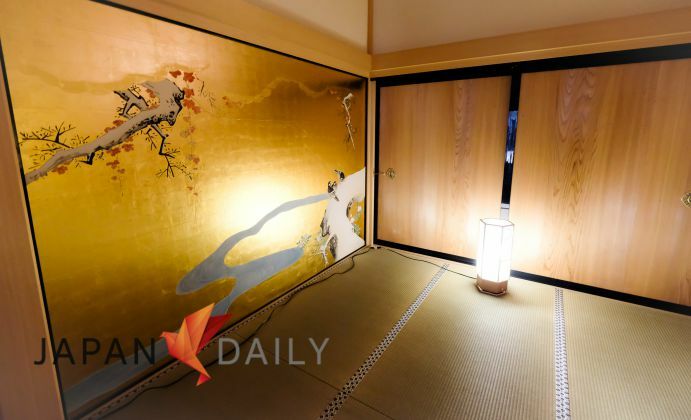 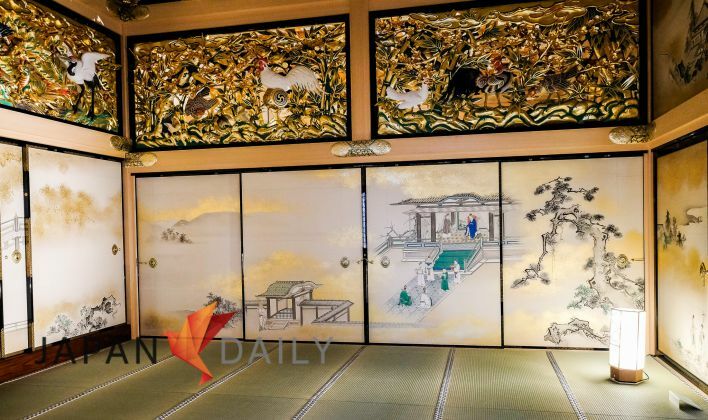 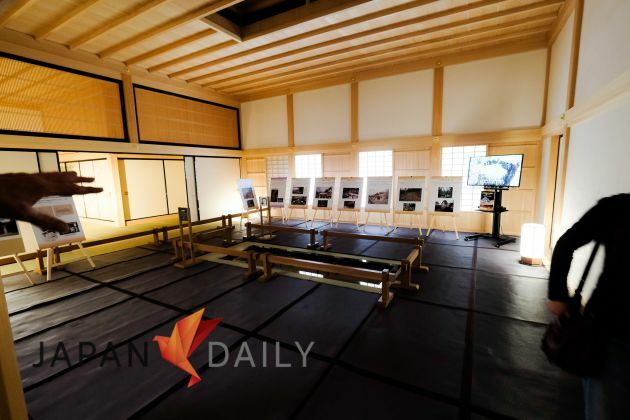 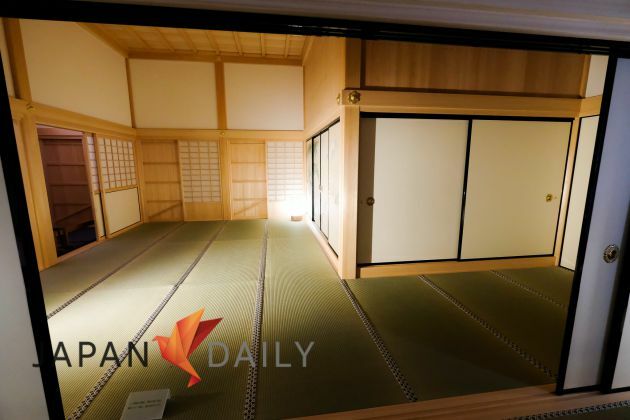 Each and every room inside the Honmaru Palace has it’s very own story to tell. 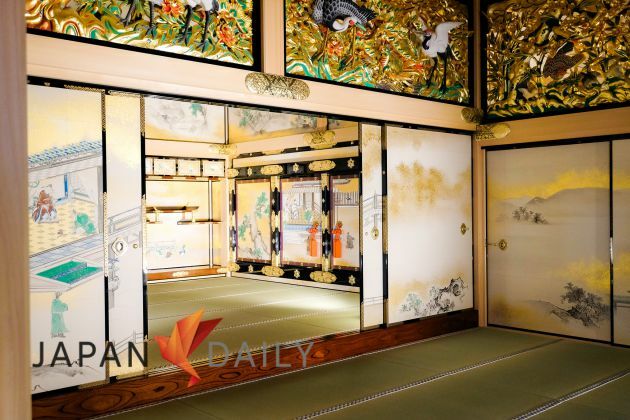 There are three sections inside: The Genkan and Omoteshoin entrance halls, the central Taimenjo reception hall and living area, and the Jorakuden, which was used primarily as accommodation for the Shogun. 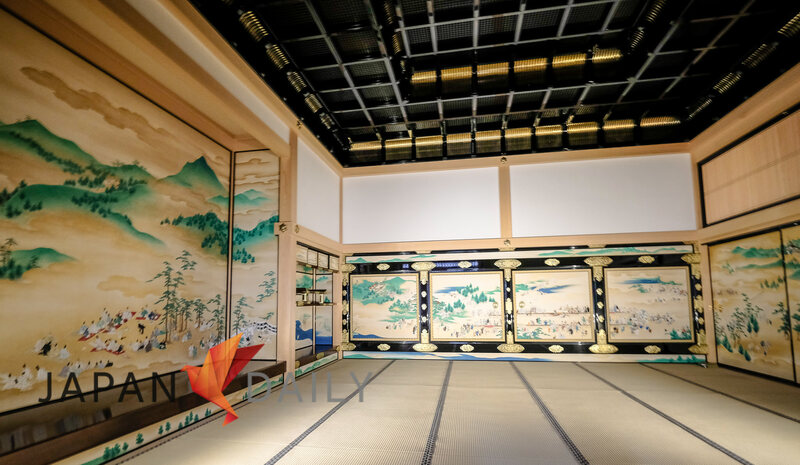 Many of the original paintings displayed in the Hommaru Palace were removed and put into storage towards the end of WWII, and so escaped the devastation of fire. Close analysis of these surviving masterpieces, along with the remaining highly detailed photographs available only to the Nagoya Hommaru Palace, have helped the classically trained artists to faithfully recreate the wonderful images, styles and colors of the original Kano School masterpieces. 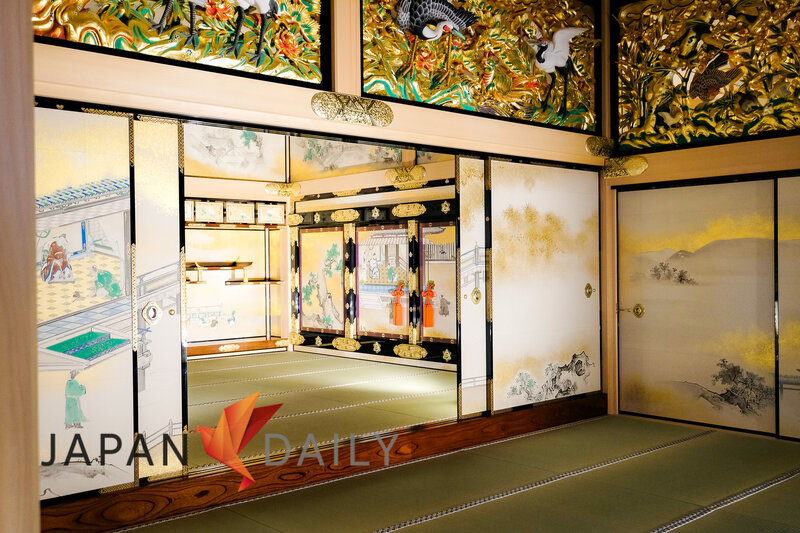 The most luxurious of the Hommaru buildings also featured richly decorated walls and ceilings, and an intricately carved and gorgeously painted transom. This part of the palace was extended to include lodgings for the shogun on his journey en route to the capital, and was also known as the Onari Shoin. 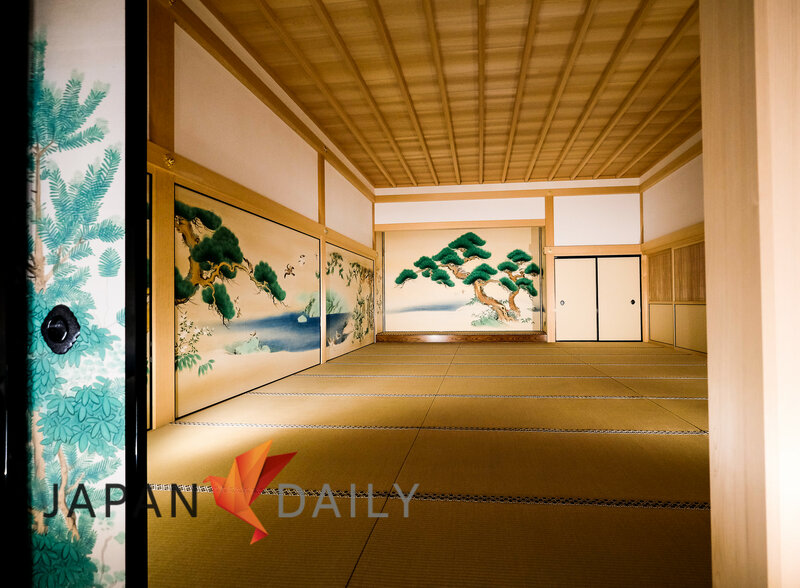 The Yudono Shoin with the sauna-like Kamaya, boiler and bath room, a Jodan-no-ma, Ichi-no-ma and Ni-no-ma were additions added to the palace in 1634 during Kan’ei period, along with the Jorakuden prior to the Shogun’s visit to the capital. 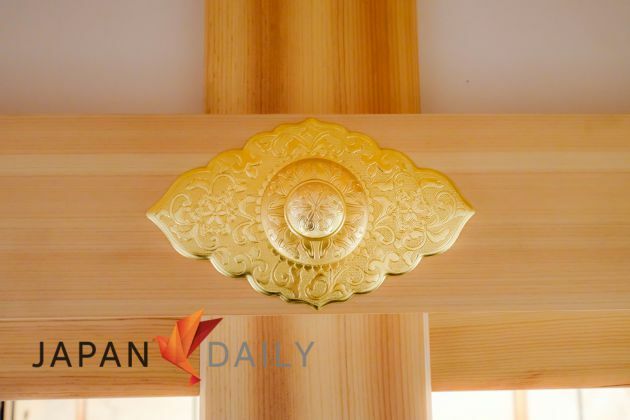 While most of the Hommaru Palace was built completely in fragrant hinoki cypress wood, high quality pine wood was also used in the Kuroki Shoin area. 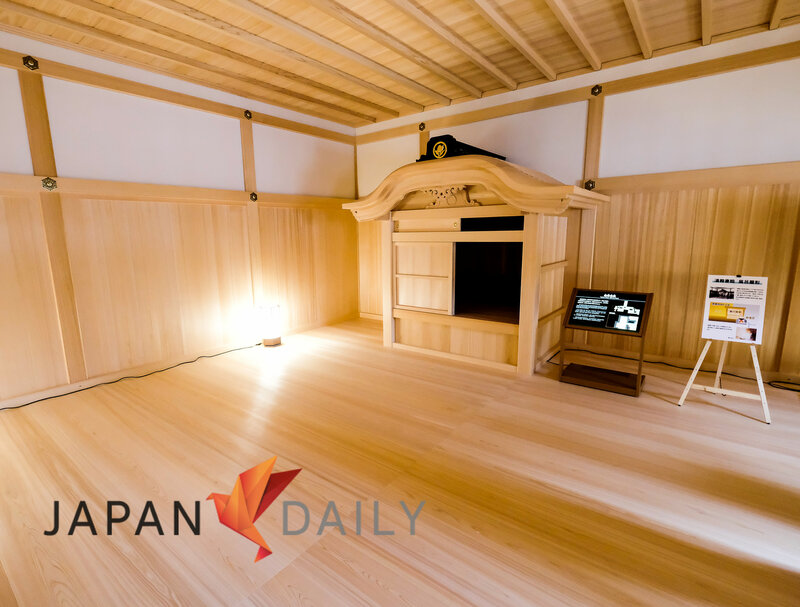 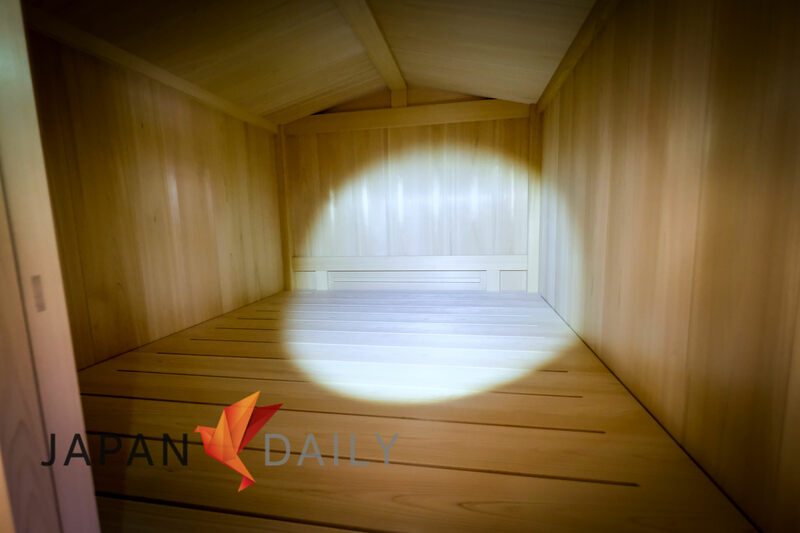 The pine is said to have been recycled, brought from Tokugawa Ieyasu’s living quarters at nearby Kiyosu Castle. 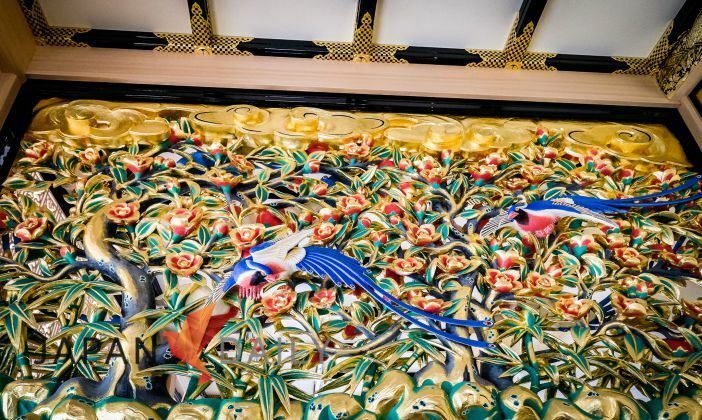 People say that there’s not much to do or see in Nagoya, but with this addition, Nagoya is becoming more interesting for locals, history buffs, and casual travelers alike. 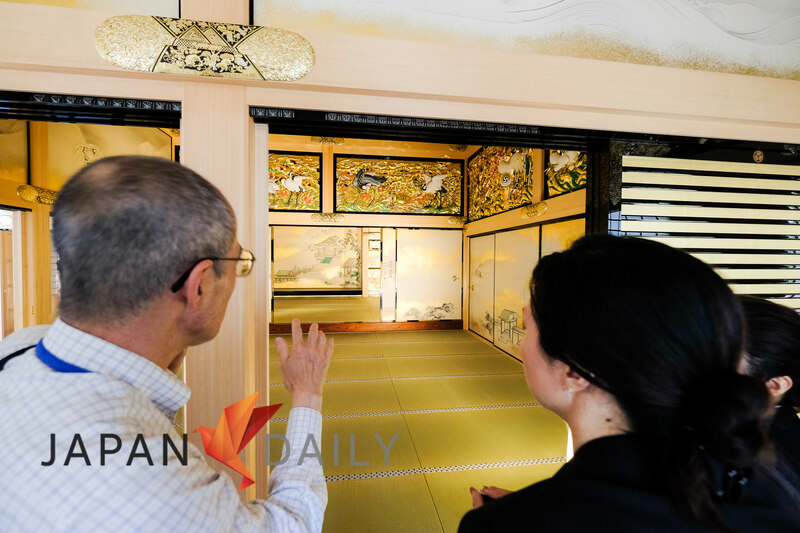 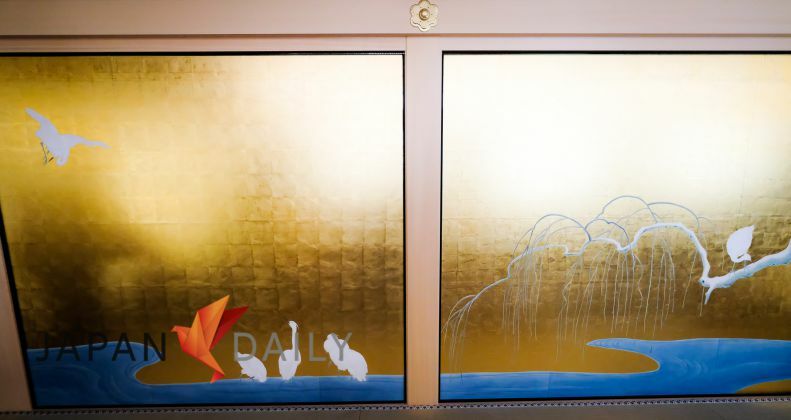 We were very lucky to have Australian DJ, columnist, author, and Nagoya’s History Buff extraordinaire, Chris Glenn, give us a special tour of the completed Palace. He is one of the people directly involved with this restoration project, and clearly has a deep passion for wanting to show Japan’s true history to anyone interested, by utilizing his long experience in the media to work as an advisor at municipalities across Japan on inbound tourism and urban design. 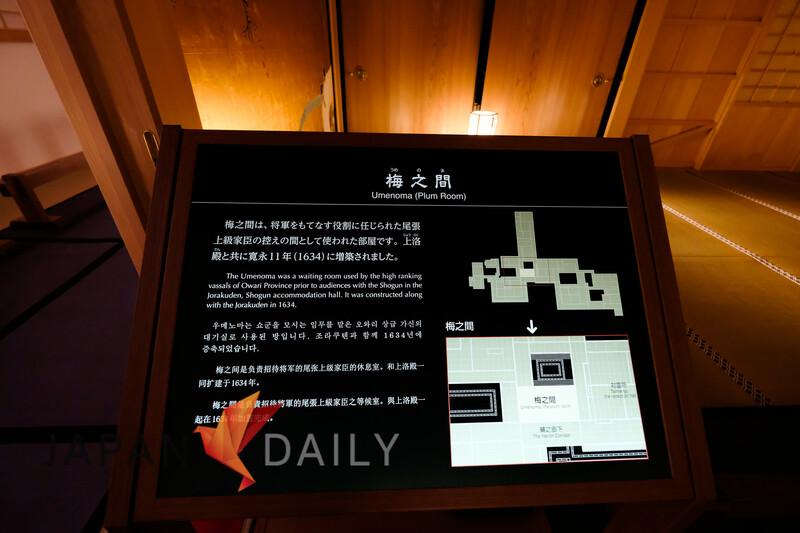 Nagoya especially, has been skipped over by most tourists, but there is a lot of important history to be found here, and this re-building of the Honmaru Palace, and subsequently, the soon to be restored Nagoya Castle itself, will surely put this relatively quiet city more on the map and help to change it’s image from “just a stop on the Shinkansen between Tokyo and Osaka” to “an interesting, historical city with world-heritage sites to visit”. Thanks for reading, and we hope you too will make the trek to Nagoya and see this magnificent place with your own eyes soon.